Smile Network with Sir Charles: Where Was I Last Night? I drove into town at 60 miles per hour. The highways and byways were surprisingly free from accidents and breakdowns on this partly cloudy Friday afternoon. I had found my exit ramp, traveled a couple of miles and then parked my vehicle in front of my favorite bar for happy hour. As usual, I received the normal greeting from the waitstaff - similar, to the television show, Cheer's waitstaff yelling, "Norm!" when he walked into the fictional bar. I began to wonder if I am developing a drinking problem. But, I'm going to believe that the waitstaff at Maria's enjoy my company and sense of humor. Chad, the bartender, had just finished pouring a glass of Jim Beam with just a splash of water and gently placed it on the oak bar accented with turquoise colored tiles. I promptly sat behind the glass. Patrons easily flowed in and out of the quaint establishment for dine in or take-out pizza while I enjoyed another glass of Jim Beam bourbon. After a few moments, a short, full figured woman with large hips and booty entered the bar area and jumped onto a bar stool. She conversed with the owners, ordered a drink and waited for her "to-go"order. Once her "to-go" order had arrived; she swallowed her last few drops of liquor and placed the glass on the bar. I'm guessing that because she was so short with plenty of hips that she had to jump off the high bar stool. And, yes she landed safely on both feet. Finishing my second drink, I turned toward the large picture window and noticed that darkness had covered the City of Petersburg. I thought, "I had no idea it was that late. Plus, it's raining really hard, too." I then said aloud, "Chad, pour me one more for the road - while I can still see the road. I might as well stay until it stops raining." Some time later, I had paid my tab, left a generous tip and drove to my house. En route, I had noticed that the sun was now shining - again. "It was dark awhile ago. Maybe I need to stop drinking because I can't tell the difference between night and day - Not!" I said aloud. Once I pulled into the driveway, I had noticed that Mr. Pair had mowed the lawn for the week; even though he left a tall weed in the front yard. But, I'm not complaining. I entered my house, drank some water, put on my pajama bottoms and crawled into bed. And, that is where I stayed until the next morning at 6:00 a.m.
Yawning and stretching and trying to recollect the previous evening, I turned on the Samsung flat screen television, poured myself a large glass of water and found the local news station ready to report about a devastating event in the city. "I wondered what happened?" I asked myself. 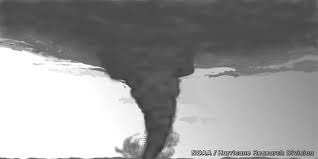 After a thousand commercials, the young broadcaster announced that the City of Petersburg had been ravaged by a tornado on last evening causing one-million dollars in damages. "What?" I said toward the television screen. "A tornado?!? Where was I last night? How did I miss a tornado?" I asked myself over and over again. Before, I had finished my first glass of water, I remembered, "Oh! I was at the bar drinking liquor during the tornado. I wondered why it got so dark so early. All of that devastation going on around me, and my face was buried in a glass of liquor....."